What a wonderful privilege to be on the Viking Sky cruise. I flew into Norway on Delta and KLM and arrived in Bergen mid-morning, after about an hour’s sleep in two days. I forgot that it would be an ocean going vessel, so I was pleasantly surprised to see the size of the ship. I have a fun roommate, Debby, who is a fellow travelwriter. Bergen, also known as the ‘town with seven mountains’, is a typical Norwegian town, very clean, with colorful, old buildings lining the port. A most unusual event occurred in 1944 when a Dutch steam trawler occupied by the Germans was allowed to dock in the harbor carrying 273,000 lbs of dynamite. It blew up by accident, destroying half the town. The resultant waterspout sent the anchor into the sky across town where it remains lodged to this day on a nearby mountain, 1368 feet high. The highlight at this first port of call was a visit to Troldhaugen where Edvard Grieg, Norway’s most well known composer resided for many years. We visited the villa where he and his wife Nina lived and saw their graves encased in the hill nearby. We were treated to a wonderful recital of his works in a beautiful concert hall next to the house. The huge glass window at the back of the stage behind the grand piano offered a pictoresque view of the fjord and the small hut he used as a workplace. 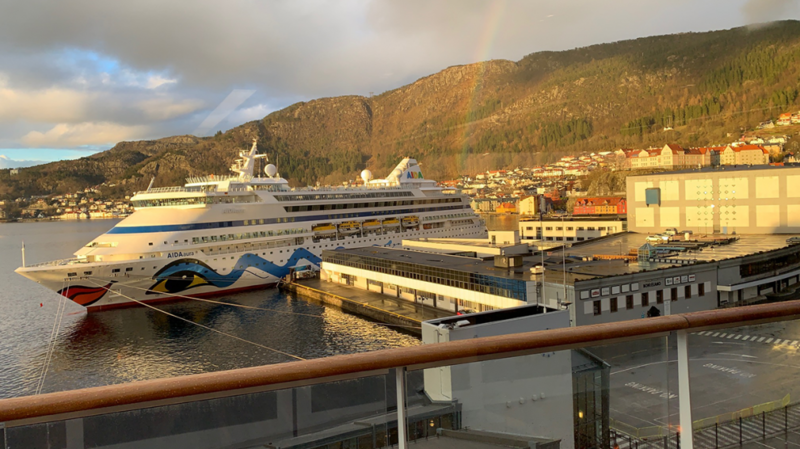 The cruise is living up to its name: ‘In search of the Northern Lights’ – it is like being on safari – no guarentee that there will be a sighting, but if the sun comes out during the day and conditions are favorable, we will be rewarded! There has been some excellent lectures already, in particular by the charismatic and entertaining Michael DiSpezio who brings science to life! He has published a number of books and is very involved in projects for children. As the ship left port yesterday, we plunged into Norwegian cuisine: last night, a seafood extravaganza: Norway Lobster, Alaskan King crab legs, shrimp, Osetra caviar, cod fish and mussels. For breakfast today, pickled herring and a Danish! And lunch, Norwegian oxtail stew, just like my mama made it in South Africa. 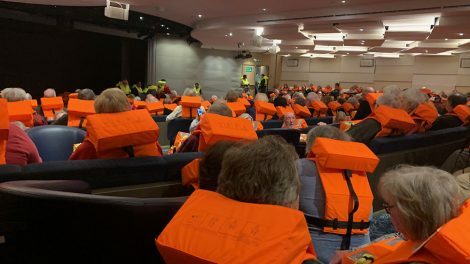 Today we had a fun event on deck when passengers and some crew members in full regalia took the polar plunge in a jacuzzi filled with ice water and cubes of ice in anticipation of us crossing the Arctic Circle this evening at 9:10 pm. I focused on my travelwriting research last night when I experienced the uniqueness of the Nordic bathing tradition – alternating hot steamy saunas with sitting in an ice-filled snow cubicle. But, the experience went deeper than that! Scrubbed down, oiled up, whacked with birch tree leaves, and a foot massage – thank goodness I could keep my clothes on! I slept like a baby.